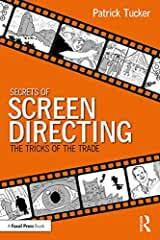 Focal Press has published Secrets of Screen Directing: The Tricks of the Trade, 1st Edition. Secrets of Screen Directing: The Tricks of the Trade is a practical guide which bridges the gap between classroom learning and the realities of being on a set. Author Patrick Tucker uses insights and techniques gained from over 40 years of directing both screen and stage to open up the craft of effectively telling stories, exploring the reality of a directing career with practical day to day solutions and problem-solving methods for working directors. This book addresses the fact that most professional directors spend their careers directing other writers’ scripts, and deals with the practicalities of working on continuing dramas. Following the Director’s mantra of ‘show, not tell’ it contains over 300 illustrations, diagrams, paperwork examples and floor plans, with lists and charts throughout. Covering planning, preparation, and shooting a project, it delves beyond just script construction and into the nuts and bolts of screen directing. Directors at any level are always under huge time constraints, and this book provides immediate and simple solutions to working under such restrictions. This is an ideal resource for filmmaking students and early career directors to refer to when encountering a problem, as well as all those screen enthusiasts, actors and writers, who want to know what directors actually do.